Classically finished in Arctic Silver Metallic, the exterior of this 911 perfectly complements the grey leather interior. 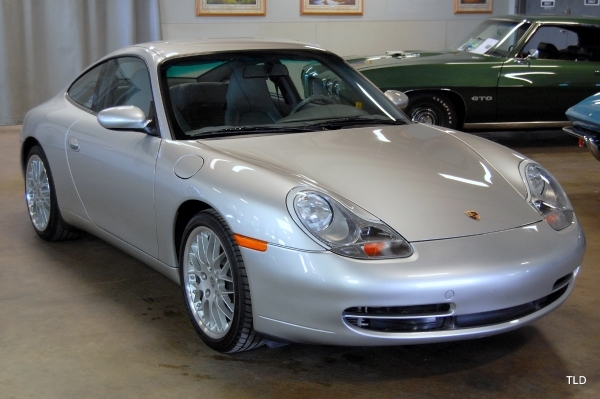 The all original exterior paint is highly polished and shows like new on this Porsche. Inward, the leather seats are in near new shape showing little wear. Optioned with the carbon kit, carbon fiber accents can be found throughout the interior. Options include comfort leather seats, the AM/FM stereo with in dash CD Changer, and the auto climate control. Powered by the 3.6 liter flat-six engine, this 911 makes 300 horsepower and 258 foot-pounds of torque. Coupled with the 6-Speed Manual transmission, this 911 blazes through the gears and recent brake work helps bring this rocket to a halt. Good service history comes with the car and establishes a pampered life, including recent reseal on the valve covers too. Garage kept and well serviced, this 996 is tight and runs like new. A thorough TLD detail has just been performed so if you're looking for supercar performance in a legendary package, it's tough to top this 911. Stop by and see how nice this Carrera really is, down to The Last Detail.